The erratic and evasive action of the Headbanger lures gives you the ultimate tool to perfectly.. 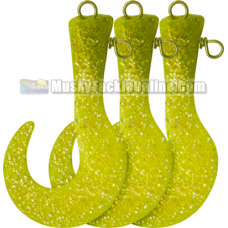 Extra tails for the Headbanger Tail to replace your old ones when they get torn apart by the fi.. Combining the erratic and evasive Headbanger movement with the fish-like characteristics of the fixe.. Extra tails for the Headbanger Shad to replace your old ones when they get torn apart by the fi..